I was wondering if there are any generic plotting tools available in the unix toolbox? By plotting I mean simple bars or things you see in many curses based utilities. And by unix toolbox I mean things that you can pipe data into them using standard unix conventions. I need to count somethings in log files (that I am monitoring with tail -F or something) and plot live ratios of things (like percent errors or warnings). You're looking for gnuplot, with the option terminal set to dumb. Not my first choice, because I have ROOT on all my machines, but a reliable, ubiquitous standby. Cernlib's PAW could also do ASCII output, though you'd have to be pretty brave to actually use it as it appears to assume that you have a 132 column fan-fold terminal. 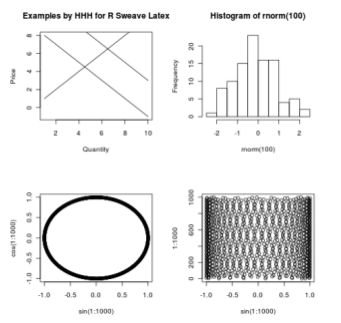 You can use R which can produce you some pretty nice graphs and do lots of statistical analysis on your data. This blog post shows you a way to do it. "Generic plotting tools available in the unix toolbox" is probably every basic Un*x tool, you need to combine tools to create things. I love to combine Latex, R and Sweave! The term "logs" leaves the question a bit open but apparently by purpose, notice the term "generic". So nothing about pre-processing with AWK/SED/etc and only about plotting coming in text-files. Have fun! Now the next puzzle is accessibility (supposing the op wants ASCII output, not just generic tool). Sorry I do not yet have an answer for it but I will list below info for further exploration. Just thinking aloud: choose raster image format such as TIFF and then just print evevery 100th column or s/thing like that to see it. Sorry just speculating but I know that TIFF is a de facto raster image format for all kind of archival purposes -- I do not know yet exactly how the OCR engines, such as Tesseract, handle them but but here the problem is easy because you can skip a lot of stuff in the preprocessing of the image -- because we do know how R generates them. Someone got an idea how do this? Or am I reinventing the wheel? At the simplest, pick out a tool that generates hings to ASCII, a bit restrictive to be "generic". Which tools for ASCII portfolio visualization? Something like this will work on just about any linux system, and the output and parameters are easy to tweak. The overhead compared to using something like gnuplot is miniscule. Not the answer you're looking for? Browse other questions tagged text-processing logs plotting or ask your own question. How can I use unix tools with Cyrillic text? How can I split a text file based on the content into multiple text files? Any Text File Merge Tools?